hitparad.se - Panic! At The Disco - Too Weird To Live, Too Rare To Die! This was reasonably decent, but it's such a disappointment to me after their first three albums. Nothing overly stands out and I won't be buying it; I'd rather not have it in my collection. I'm most likely judging it harshly because it's them; it it were someone I hadn't loved before, I'd like it more, but then, I may not have even bothered in that case. This is a fantastic album that shows Panic! (which is basically just Brendon these days) can essentially make any genre work for them. It isn't like their previous albums, but are any of their four albums that similar at all?<br><br>This time, Panic! heads into new wave territory with their most electronic offering to date. Never fear, the rock is still there at times (see: 'Miss Jackson'), as is the power pop (see: 'Girls/Girls/Boys') and the new addition of melancholic electronica (see: 'Girl That You Love').<br><br>The album doesn't really have any bad tracks as such, but the definite highlights are the insightful 'This Is Gospel' (which has a stunning music video too), 'Girls/Girls/Boys' and the rip-roaring 'Nicotine'. <br>Für mich das Beste Panic! At The Disco Album! I am a casual fan of Panic! 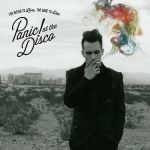 At the Disco, and most of their albums have been pleasant surprises, this to me is my least favourite of them all - I feel like Panic! 's uniqueness is lost in the desire to seem cool and hip (or whatever was hip in 2014). As a result, most of this doesn't sound genuine. This Is Gospel is most likely my favourite on here, but nothing really stands out above the rest. A consistent listen, but a little bit of a letdown, still a 4. 3.7/6.